Insteon switches are beautifully designed, reliable and can be used on their own, with other Insteon devices for remote control, or as part of a larger automation system for full featured automation. They are designed to be used in new construction or retrofit applications and can be part of elegant single room or whole house lighting scenes. On/Off switches are appropriate for use where dimming is not possible or required, and can support lighting, fans, motors and ballasts to their maximum rating (below). Dual Band INSTEON technology, uses both powerline (house wiring) and wireless INSTEON communication simultaneously for the best possible communication reliability. 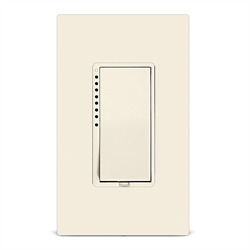 The dimmer can be directly controlled by any other Insteon transmitter including other Insteon switches or keypads, as well as RF only devices such as the RemoteLinc2, making it perfect for standalone home theatre lighting, bedroom lighting, or as part of a larger INSTEON network. For a 3 Way, 4 Way or Multi-Way situation, install one 2477S or an Insteon Keypad controlling the load(light), then install additional 2477S units as needed simply giving them power and then create an INSTEON link back and forth between units. Using this technique you can create 3 way switching anywhere in the house even if it was never wired for it! Supports INSTEON only. X10 no longer supported. Does not include trim plate. 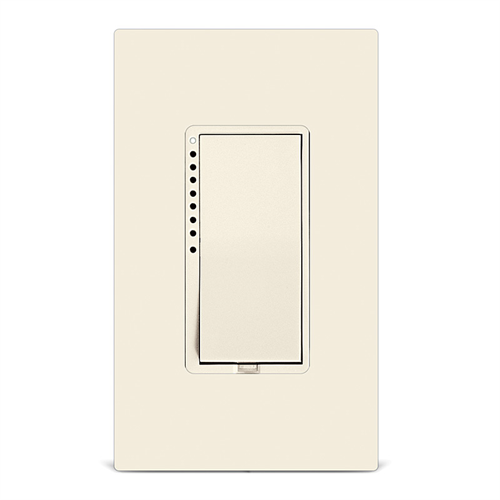 Insteon Screwless Plates or Leviton crewless plates available or use with standard Decora style plates.